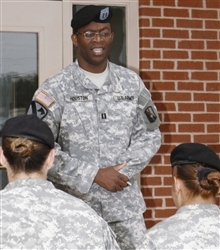 FORT DETRICK, Md., Oct. 30, 2008 – In most ways, Army Capt. Alex Houston is like any other Army commander. He comes to work here every day ready to lead and set the standard for the soldiers who work for him. He diligently performs all of his administrative duties as the 21st Signal Brigade Headquarters and Headquarters Company commander, and he gets down and dirty with the unit during company physical training. He jokes with his staff, and even has been known to sing off-key for them. And he does this all as a wounded warrior. As a platoon leader in Iraq, Houston lost his left hand when his convoy was attacked during a night mission. The electricity was going on and off while his 1st Cavalry Division unit was on patrol, Houston recalled. “It was so dark -- the kind of dark that you can’t even see your hand in front of your face,” he said. As the lights flickered off, the unit’s battalion commander came under fire from enemy forces. Although others were in the area, Houston said, he was trained to step up as the ranking officer on the mission, and he headed into the battle to support his commander. He took charge, and while on the radio, he also took a hit. His duty came before the pain, he said, and his faith in God allowed him to remain calm and accomplish the mission of getting the convoy through the area. “After everyone came over to see how I was, I kept saying, ‘I’m OK.’ And I was,” he said. He was rushed to the combat support hospital, and doctors later told him they couldn’t save his hand. The division commander presented his Purple Heart while he was still sedated in the combat hospital. Houston was given the choice of going back to Fort Hood, Texas, or to Walter Reed Army Medical Center in Washington, D.C. Having heard the Army’s best care was at Walter Reed, he said, he spent about a year recovering there. While at Walter Reed, he had access to many programs that helped wounded warriors transition into the civilian job market, but he said when the Army asked him if he wanted to stay in, he knew his answer was yes. Houston, who started out as an enlisted soldier, already had made a commitment to a career in the Army. “I made a decision a long time ago that I’m going to give 100 percent,” he said. Before he deployed to Iraq and before he attended Officer Candidate School, Houston was a chaplain’s assistant for the 21st Signal Brigade. Army Col. Theresa Coles, the brigade commander, said Houston was an easy choice to take command of the headquarters company, since he desired to lead and already had strong connections to the unit and Fort Detrick. Coles said she couldn’t be happier with her decision, as Houston has been an outstanding company commander.